Citation: K.Lavanya, Prof.K.S.Thirunavukarasu. (2015). An Efficient Data Explore Scheme with Multiple DHT in Mobile Wireless Networks. 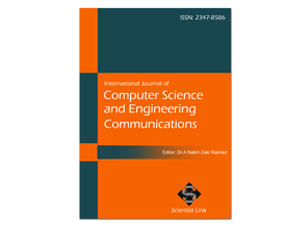 International Journal of Computer Science and Engineering Communications,Vol.3,Issue.2,pp.781-786. Multiple Mobile Distributed Hash Table used to make easy the data search over the large scale infrastructure. And also it is used to enhance the mobility resilience and reduce the maintenance overhead. To augment the data search over large scale infrastructure extend the work in Locality-based distributed Data search system, Mobile Distributed Hash Table maps data on to mobile nodes by storing the data on the node that moves along the most similar path to that associated with the data item. Finally multiple Mobile Distributed Hash Table for System divides network into a number of geographical regions. The metadata of a file is mapped to a region using the Mobile Distributed Hash Table data mapping policy, and metadata is stored in a subset of the nodes in the region, thus enhancing mobility spirit. A node needs to update data mapping only when it moves crossways regions, thus reducing safeguarding overhead. Index Terms− Mobile Wireless Network, Region, Multiple Distributed Hash Table. Mobile wireless sensor networks (MWSNs) can simply be defined as a wireless sensor network (WSN) in which the sensor nodes are mobile. MWSNs are a smaller, emerging field of research in contrast to their well-established predecessor. MWSNs are much more versatile than static sensor networks as they can be deployed in any scenario and cope with rapid topology changes. However, many of their applications are similar, such as environment monitoring or surveillance. Commonly the nodes consist of a radio transceiver and a micro controller powered by a battery. As well as some kind of sensor for detecting light, heat, humidity, temperature, etc. Since there is no fixed topology in these networks, one of the greatest challenges is routing data from its source to the destination. Generally these routing protocols draw inspiration from two fields; WSNs and mobile ad hoc networks (MANETs). WSN routing protocols provide the required functionality but cannot handle the high frequency of topology changes. Whereas, MANET routing protocols are can deal with mobility in the network but they are designed for two way communication, which in sensor networks is often not required. A Mobile Ad hoc network (MANET) is a continuously self-configuring, infrastructure-less network of mobile devices connected without wires. Each device in a MANET is free to move independently in any direction, and will therefore change its links to other devices frequently. Each must forward traffic unrelated to its own use, and therefore be a router. The primary challenge in building a MANET is equipping each device to continuously maintain the information required to properly route traffic. Such networks may operate by themselves or may be connected to the larger Internet. They may contain one or multiple and different transceivers between nodes. MANETs are a kind of Wireless ad hoc network that usually has a routable networking environment on top of a Link Layer ad hoc network. MANETs consist of a peer-to-peer, self-forming, self-healing network in contrast to a mesh network has a central controller. Ad-hoc networks form spontaneously without a need of an infrastructure or centralized controller. This type of peer-to-peer system infers that each node, or user, in the network can act as a data endpoint or intermediate repeater. Thus, all users work together to improve the reliability of network communications. These types of networks are also popularly known to as mesh networks" because the topology of network communications resembles a mesh. S. Guo, Y. Gu, B. Jiang, and T. He, ‘‘Opportunistic Flooding inLow- Duty-Cycle Wireless Sensor Networks With UnreliableLinks,’’ inProc.MobiCom, 2009, pp. 133-144. S. Ratnasamy, B. Karp, S. Shenker, D. Estrin, R. Grovindan, L. Yin,and F. Yu, ‘‘Data-Centric Storage in Sensornet With GHT: A Geographic Hash Table,’’Mobile Netw. Appl., vol. 8, no. 4, pp. 427-442, Aug. 2003. S. Datta, I. Stojmenovic, and J. Wu, ‘‘Internal Node and Shortcut Based Routing With Guaranteed Delivery in Wireless Networks,’’ in Proc. Cluster Comput., 2002, pp. 461-466. G.D. Stefano and A. Petricola, ‘‘Distributed AOA Based Localization Algorithm for Wireless Sensor Networks,’’ J. Comput., vol. 3, no. 4, pp. 1-8, Apr. 2008.